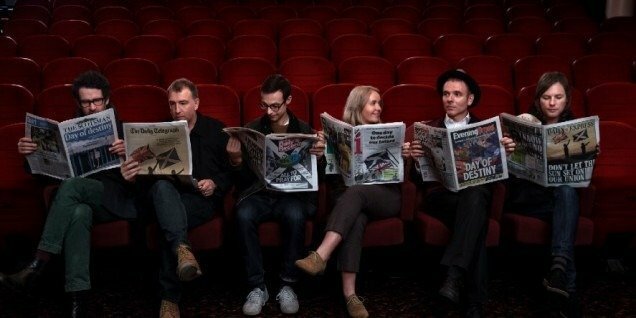 I have to start this review with a confession – I’ve never quite got Belle and Sebastian. They’ve had moments of indisputable genius in the past but I’ve never found myself fully gripped by one of their albums. This new album is a different proposition entirely however; it’s a fantastic listen from start to end and, all hyperbole aside, is surely already a candidate for album of the year, as ridiculous as that may sound written as it is on the 7th of January. There are parts of this album that are so instantly catchy and just bloody marvellous that I defy anyone not to fall under its spell. The first thing I noticed about the record is the overall sound. It’s much fuller, much bolder and, frankly, much ballsier than they’ve ever sounded before. Their gig this May at the Hydro may well be one of the factors leading to that as, in places, this album sounds ready made for arenas which will inevitably be filled with thousands of people rightly jumping around with utter joy. We start off with Nobody’s Empire, a track was previewed on the band’s site in December, and it’s a perfect start to the album. An early era R.E.M. like melody kicks us off leading into a typically Belle and Sebastian opening line about lying on a bed and reading French. We’re in familiar lyrical territory certainly, but the music is stronger than ever and the song, indeed the album as a whole, has touches of Arcade Fire throughout. I guess that’s no surprise really as than band’s aren’t entirely dissimilar. The song also, unsurprisingly, is built around a great melody and builds towards a chorus that is almost soul like. A great start, as any track that features the word Empire has to be after The National nailed that on Boxer. Track 2, Allie, is another track whose guitars seems to reference R.E.M in their breakthrough mid to late 80’s period albeit that’s only a brief reference point as the song is very much a Belle & Sebastian song and its effortless melody is, again, superb and brings to mind Simon and Garfunkel in places and that really isn’t bad thing at all. All well and good and guitar band so far. Something happens with track three, The Party Line. 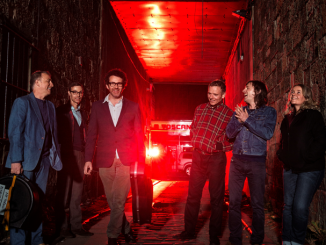 Suddenly, Belle and Sebastian stop sounding like the indie band you may expect them to sound like and they turn into Actually era Pet Shop Boys crossed with LCD Soundsystem. A clubby start, cowbells, synth bass and a vocal line that sounds like Neil Tennant being backed by Regine from Arcade Fire – it’s a remarkable song. Actually was the point that Pet Shop Boys effectively completed pop music and this song could easily fit within that band’s take of pop from that era. Plus, it demands a remix or two – if James Murphy got involved in that, music may well never recover. If you think my PSB Actually era analogy is flawed, the listen to The Power Of Three which follows The Party Line and you’ll believe me. A generally accepted fact is that What Have I Done To Deserve This is one of the best pop sings of all time; The Power of Three sounds like a reboot of it for 2015. It actually sounds like Dusty Springfield in places. It’s amazing. These are genuinely two of the best songs I’ve heard in a long time and dispel any preconceptions I had about the band. The Cat With The Cream, changes the pace delightfully a string laden tearjerker of a song that is one of those tracks whose melody immediately grabs you and compels you to listen again and again. Next up however, we return to the synths with the almost hi-NRG baseline of Enter Sylvia Plath. I don’t want to push the Pet Shop Boys references beyond the point of credible comparison, but this brings to mind their Very era when they produced an endless stream of dance synthpop and this song would not sound out of place on Very. The way the band effortlessly flit between styles whilst maintaining the feel of an album as a whole piece of work really is extraordinary. The Everlasting Muse follows and we jump in style again, back onto what at least starts out as more traditional Belle and Sebastian territory. The tracks starts out sounding like a theme to an arty 60’s spy film before suddenly, unexpectedly, but rather marvellously, turning into something that sounds like a Balkan folk song like Beirut on the Gulag Orkestar. The LCD Soundsystem like in places Perfect Couples comes next and whilst it’s not the strongest track on the album, it’s still catchy as anything and again has a melody you can’t forget, much in the same way as the more acoustic Ever Had A Little Faith, the following track has too. The pace of the album may have slowed over since Enter Sylvia Plath, but that changes with Play For Today, a track that is seven minutes of brilliance that makes you want to listen to it under a glitterball. Hugely impressive stuff. The penultimate The Book Of You is one of those Belle and Sebastian tracks that is propelled along on a bouncy, poppy melody that can’t fail to put a smile on your face and it has one of the most perfect choruses I’ve ever heard. We then end on Today (This Army’s For Peace), a woozy, hypnotic ending that is the perfect ending to what is a near perfect album. The first thing you want to do when the song ends is put the album straight back on again and relive what has been a truly memorable experience. Like I said at the outset, I’m wary of the hyperbole that revising albums in January can bring, but this album is truly superb. Belle and Sebastian have outdone themselves and made an album that it’s impossible to do anything other than fall in love with.